In this image made from video and posted online from Validated UGC, a Civil Defense worker carries a child after airstrikes hit Aleppo, Syria, April 28, 2016. U.S. allies in northern Syria, fighters from a Kurdish-dominated alliance and militiamen from the Western-backed Free Syrian Army (FSA), clashed Thursday as Russian and government warplanes increased airstrikes on and around the city of Aleppo. As fighting intensified, the U.N. envoy to Syria pleaded with the United States and Russia to intervene "at the highest level" to revive struggling peace talks, saying a partial truce reached in February was now “barely alive.” Rebel leaders said the cease-fire was dead in all but name. That was clear on the ground in northern Syria as fights erupted among an array of armed groups, some, in theory, on the same side in opposing President Bashar al-Assad. Syrian government and Russian warplanes also intensified airstrikes in the north, hitting an Aleppo hospital supported by Doctors Without Borders Wednesday night, killing 14 civilians and three doctors, including the last pediatrician working in the rebel-controlled part of the city. The hospital strike was condemned by international medical charities. “The hospital bombing comes as the latest round of peace talks falters and the cessation of hostilities agreed in February is disintegrating into bloodshed,” says Sonia Khush, Save The Children’s Syria country director. “Save the Children partners in the area have told us of almost constant bombing and shelling this week, and urgent action is needed to save the small but crucial gains of the past few months," she added. U.S. Secretary of State John Kerry said in a statement: "We are outraged by yesterday’s airstrikes in Aleppo on the al-Quds hospital supported by both Doctors Without Borders and the International Committee of the Red Cross, which killed dozens of people, including children, patients, and medical personnel." Kerry said the U.S. was still trying to establish all the facts about the airstrike but added, "it appears to have been a deliberate strike on a known medical facility and follows the Assad regime’s appalling record of striking such facilities and first responders. These strikes have killed hundreds of innocent Syrians." He added that the regime’s most recent "offensive actions" in Syria "compound the violence and undermine the cessation of hostilities." It was not clear what steps the U.S. can take to shore up the always fragile and frequently broken cessation of hostilities agreement. 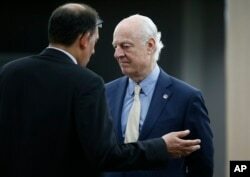 U.N. mediator Staffan de Mistura, right, listens to a member of his staff before a meeting with the Syrian government delegation during Syria Peace talks at the United Nations in Geneva, Switzerland, April 26, 2016. U.N. envoy Staffan de Mistura called on Washington and Moscow to convene a ministerial meeting of major and regional powers that compose the International Syria Support Group (ISSG). At a news conference in Geneva, he said both the Americans and Russians have “common interest in not seeing Syria ending up in another cycle of war.” He hinted some progress had been made in peace talks before the rebel negotiators left the formal discussions. The High Negotiations Committee of the Syrian Opposition, the rebel delegation to the stalled Geneva-based peace talks, questioned the credibility of the negotiations. The delegation walked out of the formal talks last week, arguing that the negotiations were not bringing Syria nearer to a political transition. The rebels insist Assad should play no part in any transition, a position rejected by Damascus and Assad-backers Russia and Iran. The HNC said instead of “meaningful negotiations the Assad regime intensified its atrocities on the ground.” The committee has called for an urgent meeting with Western and Gulf countries opposed to Assad remaining in power. Member of the Syrian interior opposition Mahmoud Marai, third right, listens to Elian Mous'ad, second right, during a meeting with the UN Syria Envoy during Syria peace talks at the United Nations Office in Geneva, Switzerland, April 22, 2016. HNC members have been briefing U.S. lawmakers privately for days that the peace talks are now effectively finished, according to Capitol Hill aides, and with it, the cessation of hostilities. Opposition political activists accuse the Assad government and its Russian backers of using the cessation of hostilities as an extension of a military strategy to undermine the rebels, saying that regime bombing and ground attacks have been targeting them as much as the terrorist groups the Islamic State and Jabhat al-Nusra, al-Qaida’s affiliate in Syria, which were excluded from the truce. “Assad regime forces and militias loyal to the regime failed to abide by the terms of the cease-fire agreement,” according to Omran Center for Strategic Studies, a pro-opposition think tank. “Assad regime forces violated the agreement many times, and quite often with Russian air support, striking Syrian revolutionary forces in a majority of the provinces. As of April 19, 2016 there were 1,180 confirmed Assad regime violations,” calculates the research group. Aside from the collapsing cease-fire, Washington will also have to consider how it can disentangle its allies on the ground. According to local political activists, Islamist factions Ahrar al-Sham and the Levant Corps, along with FSA militiamen, launched a major offensive Wednesday on the outskirts of the strategically important town of Tell Rifaat, which was captured in February by the Kurdish-dominated Syrian Democratic Forces (SDF), which is also backed, as is the FSA, by the West. In this image made from video and posted online from Validated UGC, men look at damaged buildings after airstrikes hit Aleppo, Syria, April 28, 2016. The renewed battles over Tell Rifaat, involving mortar and artillery exchanges, leaving casualties on both sides, will further complicate U.S. efforts to shape a coherent on-the-ground alliance to fight the Islamic State terror group. The Syrian Observatory for Human Rights, a London-based monitoring group that relies on a network of local activists for its information, reported at least 11 fighters with FSA and Islamist factions were killed in the renewed fighting. The Syrian Observatory said there were also SDF casualties but was unable to give a precise figure, although some SDF supporters put the figure at more than 60. Fighting between the two groups was also reported to have redoubled on the outskirts of the nearby town of Ain Daqna, south of Azaz, on the border with Turkey. The clashes between anti-Assad factions assisted Islamic State militants in seizing control mid-week of several villages in the northern Aleppo countryside, killing a number of rebels during the fighting, say local activists. IS has been attempting for weeks to regain villages it recently lost to the rebels. The Islamic militants were reported to have grabbed back the villages of Dudyan, Yahmoul, Jarez and Telil al-Hisin, despite a Turkish cross-border artillery bombardment aimed at halting them. White House correspondent Aru Pande contributed to this report.